How Much Does it Cost To Fly To Detroit? The cheapest flights to Detroit found within the past 7 days were $49. Prices and availability subject to change. Additional terms may apply. America’s most-beloved blue-collar burg, Detroit, has evolved from its original car-making "Motor City" fame, offering all the sights and amenities of any large modern metropolis. You can cheer on professional sports teams, hang out at clubs that were once speakeasies, or shop at upscale boutiques and spacious fashion malls. A cluster of tall buildings greets you as you fly into Detroit Metro Airport (DTW), the primary hub for Michigan’s Detroit flights. The structures form part of the Renaissance Center, a symbol of the downtown's rebirth as a cultural and retail powerhouse. Let Travelocity help you find the best prices on Detroit airfare so you can focus on planning your itinerary for Motown. Stay at one of the larger hotels near DTW airport so you can score free shuttles that many hotels provide outside of the baggage claim. Otherwise, given the city's automotive past, you can drive your own private vehicle from any of the major agencies that occupy the rental-car campus near the flight facility (free shuttles will take you there from the airport). To skip driving entirely, book a taxi cab or luxury sedan from the ground transportation center at each terminal. If you bought cheap tickets to Detroit, inexpensive public buses are also available from the North and McNamara terminals. In addition to Detroit plane tickets, many vacation packages already include transportation, so make sure yours doesn't before booking your own ride. After your flight to Detroit lands, you'll want to check into accommodations and drop off your luggage. Unencumbered, you're free to visit the Visitors Bureau near the Renaissance Center. Ask for your free visitor’s packet; it'll show you where to go, tell you what's happening, and often give discounts for tickets to Detroit attractions. 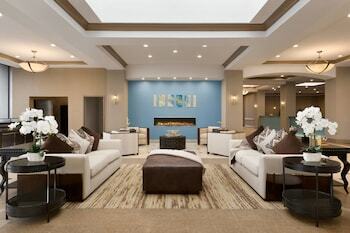 MotorCity Casino Hotel – This brand-new luxury hotel is located about five minutes from all of the city’s professional sports venues, making it an ideal place to stay if you are looking to hit the casino floor after the final whistle of the big game. Once you’ve beaten the house at blackjack, take in a concert at the on-site Sound Board music venue. 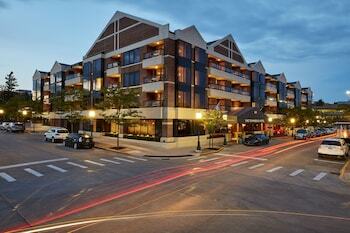 Edward Village Michigan – The postmodern façade of this upscale hotel oozes contemporary cool. Situated between downtown and the airport—as well as adjacent to the Henry Ford Museum and Ford World Headquarters—this may be the most conveniently located property in the greater Detroit area. 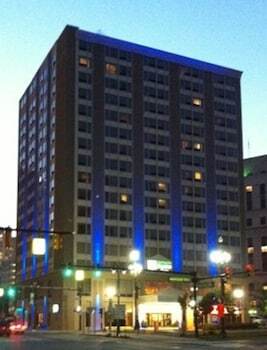 Greektown Casino Hotel – Just a long fly-ball from Comerica Park, Greektown is Detroit’s newest 4-Diamond hotel. In between sessions at the gaming tables on the casino floor, make sure to get out and explore the restaurants, shops, and culture of the surrounding Greektown neighborhood. 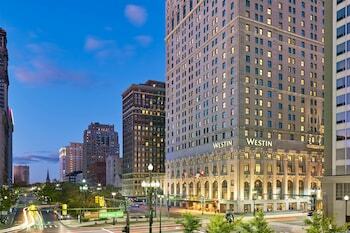 Detroit Marriott at the Renaissance Center – Resting right on the banks of the Detroit River, the amazing glass atrium seemingly serves as an entrance to the entire city, as well as to the impressive Marriott property. Enjoy sweeping views of Canada to the south (yes, the south) from your room on one of the upper floors, or take a stroll along the RiverWalk to experience a different perspective of downtown. The Henry Ford – More than just a facility honoring the great American automaker, the property is home to the Henry Ford Museum where you can learn about all his technological innovations; Greenfield Village for a step back in history; and Ford Rouge Factory Tour to explore the manufacturing marvels that helped create the Motor City. Automotive Hall of Fame – Let your inner-motor head come out and play in this one-of-a-kind attraction dedicated to mankind’s love affair with cars. See historic cars from Detroit’s most prominent automakers, as well as fascinating foreign vehicles. Professional Sports – Detroit may go by Motown or the Motor City, but to sports fans it’s known as Hockeytown. Catch a Red Wings game at the Joe Louis Arena. When the Red Wings aren’t in town, maybe the NBA’s Pistons are tipping off against their opponents that night. If you prefer outdoor sports, the MLB Tigers and NFL Lions are two other exciting athletic options. Whether you're searching for the cheapest flights to Detroit or luxury stays at five-star properties, you can use Travelocity to search over 400 airlines and more than 510,000 hotels worldwide. Travelocity’s flight deals to Detroit grant you more money to dine on the city's numerous international eateries or check out the former homes of automobile magnates. Love the fact you need your room key to use the elevators. Great safety technique! I loved that you offered free parking, shuttle service and breakfast. Those were wonderful perks to a great hotel room!